In Waterman’s case, “early” is a very broad span indeed. For the moment, I’m limiting myself to those made in roughly the first four decades of the 20th century, which have model numbers rather than names. This leaves a seventeen-year stretch before the turn of the century, which I don’t have any direct contact with and fear to speak of. The period from 1900 to about 1927 saw Waterman doing much the same as most of the other notable pen-makers of the day, offering pens with descriptive code numbers rather than the more evocative names one is now used to. This numbering system has two phases, with a change-over in 1917. Prior to that date, the codes were relatively simple and strangely uninformative; an initial digit to indicate a variation in body followed by a digit to describe the point size (1 to 0, in increasing size, the 0 being a #10 point), and in some versions a set of letters to indicate variation from the standard eyedropper-filling model and possible extra furniture. This system worked, but was not extremely flexible, and could lead to confusion; the suffix PSF could mean two entirely different types of filler mechanism, depending on just when a pen was made. This problem arose because the system was instigated before there were any filler mechanisms to worry about. 1917 saw an expanded code system, which was more capable of describing a broad range of pens in an unambiguous manner. Because it’s so comprehensive, it seems a little impenetrable, but if one had access to the explanation chart in the catalogue, it wasn’t so bad… in theory. 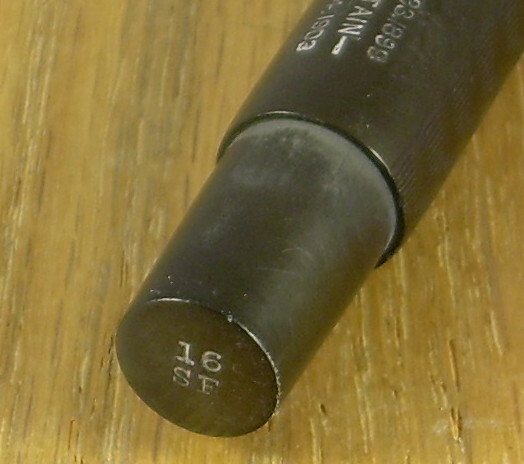 The main point of agreement between the two systems was that the right-most digit indicated the point size (which has some bearing on the barrel size, as the body remains roughly proportional to the point). The next digit to the left became an indication of the filler type and the general shape, and left again showed a body decoration; this last item could be a two-digit number, giving a possible total model number of four digits, or five if one counts the “½” which indicates a slender version. The wax was absent, so I filled it in with an easily removable powder. There does not appear to have been any adaptation of the system for the introduction of various coloured rubbers, though, which means that even before it was dropped it was not entirely capable of describing a pen completely. With the appearance of celluloid, the system began to break down. In some models, there was a vestigial deference to it as late as 1936, but other models bore only a single number and some a name. As a general rule of thumb, if a Waterman isn’t made of rubber, it falls outside this system, but if it is rubber, however late (and the current notion of an end to rubber Watermans is 1934), it does. For the most part, there’s not a lot of guesswork about what a pen’s number is; they were imprinted on the tail of the pen, and frequently highlighted with red wax. Production Run: 1900 – 1934 (broadly; specific models may vary as noted). Cost When New: Noted on individual examples (for modern values, try this calculator). Clips were an extra-cost item up until about 1925, adding between 50¢ and $3.00 to the cost of the pen, depending on material, pen size, and just when one is looking. Body: Hard Rubber, with metal overlay in some cases. Filler: Varies, see individual examples. No. 12 Production run: 1900 – c. 1925 (the last year I can find it in a catalogue, although it may run later). Cost $2.50 in 1902 catalogue, $2.75 in 1925 catalogue. Eyedropper, capacity approx. 2.6 ml. Dimensions: capped 13.4 cm, posted 17.0 cm, uncapped 12.2 cm. Waterman 12 – note the after-market slide-on clip. Without threads to keep the cap in place, Waterman did not consider this a “pocket” pen. No. 16 S.F. Production run: c.1909 – 1917 (the 1903 patent date aside, it doesn’t appear in the 1908 catalogue). Cost $5.00 (for the No. 15) in 1914 catalogue. Press-bar filler, capacity approx. 1.5 ml. Dimensions: Capped 14.2 cm, posted 17.5 cm, uncapped 13.2 cm. Waterman 16 S.F., which is also in the terms of the time a desk pen, because it’s not a pocket pen. This has a “cone cap”, because it wedges onto a conical section– you can wreck a cap by putting it on forcefully. The sleeve-filler ready for action, the sleeve slid back. The patination of the mechanism is unfortunate, but with a pen no less than 101 years old at time of photography, we’ll have to live with it. The “S.F.” in the name is for “Self-Filling” even though it is also a sleeve filler. No. 52 Production run: 1917 – c. 1934 (prior to 1917, it would have been a No. 12PSF). Cost $2.50 in 1919 catalogue, $2.75 in 1933. Lever filler, capacity approx. 1.6 ml. Dimensions: Capped 13.5 cm, posted 17.0cm, uncapped 13.1 cm. Waterman 52. I was lucky in this example, as the furniture was nickel rather than plated brass. No. 52 1/2 V w.r. Production run: 1917 – c. 1934. Cost $3.00 in 1925 catalogue, slightly higher due to gold filled furniture. Lever filler, capacity approx. 0.6 ml. Dimensions (ring not included): capped 10.8 cm, posted 13.8 cm, uncapped 10.2 cm. No. 01852 Production run: 1917 – c. 1934. Cost $4.00 in 1919 catalogue, still $4.00 in 1933 (because it was moving down-market). Lever filler, capacity approx. 1.6 ml. Dimensions: Capped 13.5 cm, posted 17.0cm, uncapped 13.1 cm. Waterman No. 01852. The numbers refer the hardware, of course, rather than the material of the barrel. Red ripple rubber (and the various other ripples) appeared in 1926, and the numbers never took notice of it. No. 01852½, w.r. Production run: 1917 – c. 1934. Cost $3.50 in 1919 catalogue. Lever filler, capacity approx. 0.6 ml. Dimensions (ring not included): capped 10.8 cm, posted 13.8 cm, uncapped 10.2 cm. This is really good preservation of the original colour. No. 55 Production run: 1917 – c. 1934. Cost $5.00 in 1919 catalogue, $5.25 in 1925. Lever filler, capacity not noted when I had it in hand. Dimensions: 14.0 cm long capped, 17.6 cm posted. Waterman 55. The picture is, obviously, from my old ill-looking site, but it is at least to scale with the others when they’re opened in separate windows. I haven’t found a band quite like this in catalogues, so it may be an after-market application; if not, the numbers aren’t right.